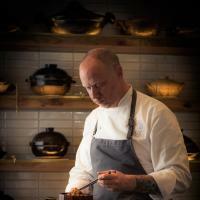 Kyle Connaughton is a chef, cookbook author, and culinary educator originally from Los Angeles, California. After living and cooking in Japan for several years he was the Head Chef of Research and Development for Heston Blumenthal at the three-star Michelin restaurant The Fat Duck. Kyle is a contributor and editor for the Modernist Cuisine series and curriculum author for Culinary Institute of America’s Culinary Science Bachelors Degree Program and co-author of “Donabe- Classic and Modern Japanese Claypot Cooking”. Kyle is the Co-Founder of the culinary development firm Pilot R+D and the Chef/Owner of Single Thread Farm-Restaurant-Inn both located in Healdsburg, CA.